Madera, CA – This morning the Special Investigations Unit served a search warrant on West 6th Street. 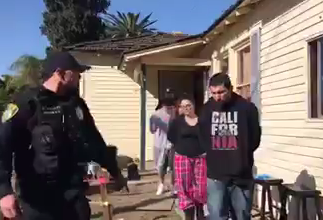 Victor Reyes, Angelique Lovato, Ashley Wenrich and Joseph Alduenda were arrested after methamphetamine was located in the house. The real victims in cases like this are the children. Not only were drugs being sold across the street from North Campus, but Social Services had to be called after very poor living conditions and methamphetamine were discovered in the areas kids were living. Please call 675-4220 if you observe drug activity. You may be saving the life of a child.